matter how hard I tried. It became Anne's Antic's by default, even though I knew what I would write here could hardly be described as antics. I have decided to call my blog 'Stitching By Numbers', the same name that I gave my Etsy shop when I opened in 2012. I feel that this name better describes me and what I do, in sewing and my shop. I sell Vintage and Newer (or 'not-so-vintage') sewing, knitting and craft patterns. I love it, although I have not been able to work on it as much as I would like lately. I literally have hundreds of patterns, and the number is growing. I belong to a fantastic team on Etsy, called Pattern Patter. I have never known a friendlier, more helpful group of women. Everyone helps each other. There is no 'I'm only in it for me!' on this team. We are all there for the same reason - to promote our own and each other's shops and to sell patterns. I am proud to be a team member. Throughout the year we have 'BLITZ' sales, in which we all post or renew as many patterns as we can in one day. This benefits you, the customer, because many of my teamies and I have fantastic sales and discounts on that day. I will be offering a 20% discount with the coupon code 'BLITZ' on sale day. 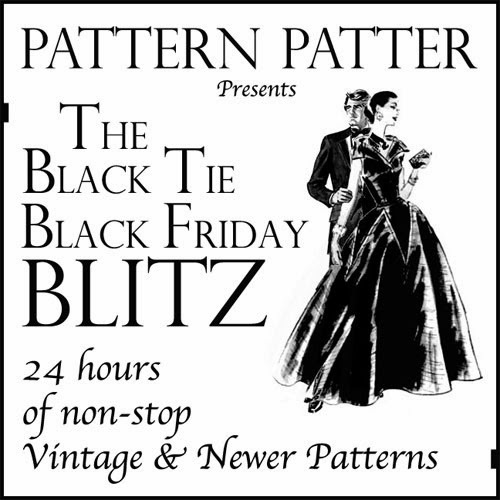 Our next 'BLITZ' is November 29th, Black Friday, with some shops carrying the sale through to Monday. So please stop by - you may find your next stitching project in my shop or in one of my teamies shops. Click HERE to see new team patterns as they are listed the day of the sale! Don't miss the best sale of the season!